The causes of chronic absence are many and varied, but the consequences consistently tend to be negative. With increased attention to attendance issues, partly spurred by ESSA, many districts are using data to better understand and identify ways to reduce absenteeism. Addressing absenteeism may lead educators in unexpected directions, sometimes focusing on solutions beyond the schoolhouse. Can a hand washing campaign aimed at young children help improve school attendance? What about connecting middle schoolers with a barber who will give them a cool haircut, for free? These are among the numerous creative and locally targeted solutions that educators are trying out, guided by digging into student data to address a pressing challenge: chronic absenteeism. More than eight million students nationwide are chronically absent, typically defined as missing at least 10 percent of school time, or about two days per month. Chronic absence rates tend to be higher among racial/ethnic-minority students and low-income students. The causes of missing school are many and quite varied, but the consequences tend to be consistently negative, according to research summarized by WestEd’s Regional Educational Laboratory (REL) West. Each time a student misses school — whether the absence is excused or unexcused, due to illness, a suspension, or some other reason — schools miss out on teaching and students miss out on learning. Those lost opportunities add up. Chronic absence can lead to lower math and reading achievement by 3rd grade and to lower rates of high school graduation later. A student who is chronically absent during just one year between 8th and 12th grades is seven times more likely to drop out of school. 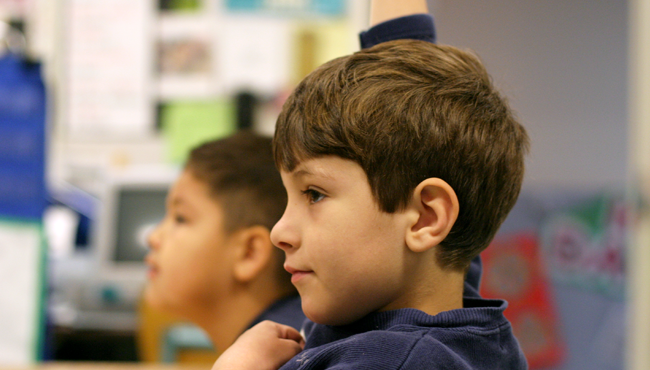 “Fortunately, though, chronic absence is a problem with really good solutions that many schools, districts, and states are pursuing,” says BethAnn Berliner, a REL West senior researcher and project director at WestEd. Berliner and REL West colleagues have partnered with districts to help educators expand and deepen their use of data to reduce absenteeism. The commonly used daily attendance rate measures how many students on average show up at school each day. Average attendance rates do not directly indicate chronic absence, which is when an individual student misses 10 percent or more of the academic year for any reason. Chronic absenteeism measures how many students have accumulated so many absences that they are at risk of poor academic outcomes. “We’ve learned the importance of breaking down attendance data into more detail — such as absenteeism by grade, teacher, subject, or demographics — to get a better sense of where and what the problem is, which in turn helps educators to craft more effective interventions,” adds Rice. With some partners, REL West has helped them to use meaningful visuals as a means to spot and show trends in order to better understand and draw implications from their attendance data. We’ve learned the importance of breaking down attendance data into more detail . . . to get a better sense of where and what the problem is, which in turn helps educators to craft more effective interventions. Beyond identifying trends, schools and districts can use data to see if interventions are working. Rice cites the example of Operation Healthy Hands, a campaign focused on early learners in the Tulare City School District in California. Because common childhood illnesses can be a big contributor to absenteeism, the district has incorporated hand washing into the curriculum, including using a “glitter bug,” a special powder placed on students’ hands that shows under an ultraviolet light if their hands need a little more scrubbing to get rid of the fake germs. The district is now tracking data to see if various hand washing efforts are making a difference in attendance rates. If one effort is not working well, the district can make adjustments or try something else, pursuing what Rice calls a “continuous improvement” cycle driven by data. Berliner’s attendance work has taken her to Tulare and two other districts in California’s largely Latino rural Central Valley — Kerman Unified School District and Parlier Unified School District, which has the biggest migrant camp in the state. Over the past few years, these districts have focused their resources to boost attendance and to support students who had been missing too much school. Some of the schools use special incentives and rewards to reinforce key messaging, such as a traveling trophy and pizza parties, to celebrate good and improved attendance. Others also enlist the support of staff throughout the school and across the district — including counselors, bus drivers, food service workers, and janitorial staff — as well as members of the community, including business and city leaders. Underlying the culture of attendance is a partnership with families, which often involves raising awareness. For example, many parents don’t know that the highest rates of absence are among the youngest, not just the oldest students — and that missing school in the early grades can result in a loss of foundational learning. “Many parents think kindergarten is for coloring and learning the ABCs,” says Torres. “But it is so much more, like learning sight words, social skills, and how to take directions from others.” It is where good attendance and learning-to-learn habits are first developed. If the reasons for missing school are related to academics, districts might focus on teaching and learning strategies, including personalization, tutoring, remediation, or after-school enrichment, says Berliner. Other reasons for being absent might be related to problems with housing, food, transportation, bullying, health, or other personal or family issues. Sometimes digging into the roots of absenteeism can take educators in unexpected directions. In Parlier, some middle school boys were skipping school because they did not see themselves as having cool haircuts, says Berliner. In response, “a local barber offered, ‘I’ll give you a good cut.’ And guess what? Those kids came back.” According to Torres, free haircuts have been funded by the Who’s Next Foundation for those who can’t afford them. Social support or basic health services — including vision, dental, mental, and behavioral health — may be part of the solution. Each of the Tulare, Parlier, and Kerman districts partners with a local school-based health center to deliver services to students. Keeping up with all these needs can be overwhelming, reflects Torres, but he says two things make all the difference. First is building a relationship with parents. “For example, we write or call the parents every time a student misses school,” he says. “If a child is close to becoming chronically absent, we meet with the parents to try to find out why the student has been missing and pull together resources that might help.” Second is building a team, he says, including intervention and prevention counselors and social workers, and sharing responsibility with them. Three videos from REL West on chronic absence nationally and on how three rural school districts in California’s Central Valley are boosting attendance. 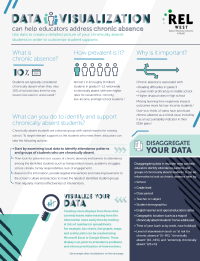 Short PDF from REL West on how data visualization can help educators address chronic absence. A REL West webinar on tracking and using attendance data to guide policy and practice. A REL Mid-Atlantic webinar that includes promising strategies for preventing and reducing chronic absenteeism. Video: Reducing Chronic Absenteeism: Every Day Counts! A video, produced by REL West, that focuses on the prevalence, causes, and consequences of chronic absence, and on how three Utah schools have boosted attendance.